At North Adelaide Dental Care office , we proudly use the iTero Scanner as an alternative to those awful goop-filled dental impressions! The iTero scanner is all about keeping you comfortable while delivering precise imagery, without the putty-filled impression tray that makes you gag! Not only is it more comfortable, it is safe , quick, and eliminates the need to retake impression multiple times . If your are interested in Invisalign® , we want you to understand that the process doesn’t have to be time consuming or expensive. With iTero®, we can provide comfortable , safe, accurate , and fast treatement in just one office visit.We want you to spend less time at the dentist’s office and more time enjoying your new smile! Contact us today to schedule an appointment. What is ITERO scanner ? 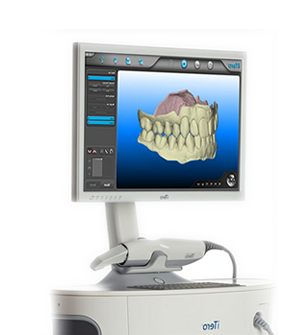 iTero scanner is a state-of-the-art digital camera sysyem that enables the dentist to take a 3D digital scan of the patient’s teeth and gum tissue , make adjustments in real time, and transmit the file wirelessly for processing.